Every year has its “smart” fad and this year, it’s the smart speaker. 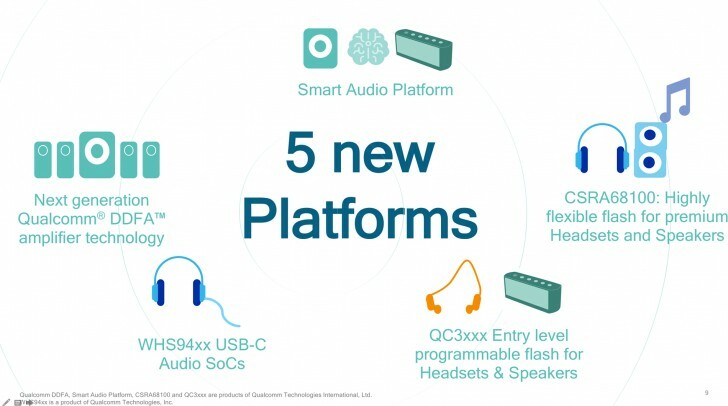 Qualcomm wants in on the action and is also preparing for a future with USB-C headphones. Two new chipsets promise to power the smart speakers of tomorrow. They supports Android Things as well as generic Linux platforms and will soon gain support for Google’s Assistant and Cast Audio as well as Amazon’s Alexa Voice Services. They can stream high quality music - either local (DLNA) or from the cloud - and take high quality aptX HD input over Bluetooth as well. They can play back just about any type of audio, including Hi-Res 32-bit/192kHz content and lossless FLAC/ALAC. The new chips support multi-room audio with multi-channel sound (you can split the home into zones and play different music in each of them too). 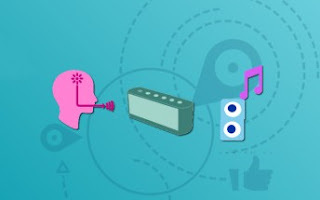 For smart speaker capabilities, these chips have far field echo cancellation and noise suppression - they can hear you clearly even in a loud, crowded room. Qualcomm also introduced chips for wireless speakers and headphones as well as others that work over wired USB-C connections. These cover the market from the low end to the high end and feature Bluetooth aptX support, noise cancellation and other features in various combinations. The top USB-C chip supports 192kHz/24-bit audio. 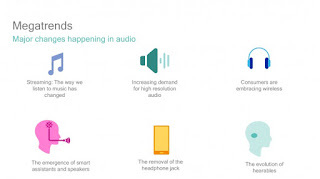 The wireless options promise long battery life thanks to improved efficiency - over 50% for voice calls and music streaming. This also enables “ultra-small form factors”. To complete the lineup, the company showed off high quality amps. They promise SNR and dynamic range up to 1313dB and noise floor modulation under 2dB.